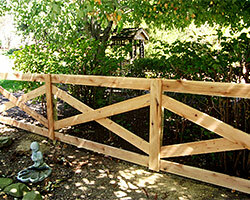 We at Creative Earthscapes specialize in installing various types of fences. For years, we have served countless commercial and residential property owners in Groove City and other major cities in the state, including Lewis Center, Reynoldsburg, Arlington, and Columbus. We can translate your ideas into reality with the help of our creative designers and skilled installers. They are among the most fun crews in the industry with a knack for creating some truly amazing fence systems for any property, big or small. Give us a call today, and let’s talk about your fencing needs. We have probably built close to a hundred fences in properties all over Grove City, as well as in other cities that we serve in OH. In fact, we’ve become so great at installing fence systems over the years that it is now part of our areas of expertise. Whether you need your fences built to protect your garden, or you want them to provide privacy to your property, we can surely follow your specifications no matter how detailed or complex they may be. 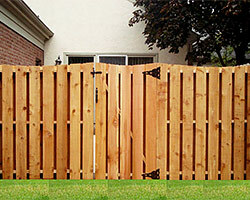 Wood/timber – A timber/wooden fence system is an all-time favorite -- thanks to its earthy appeal and classic beauty. It is also very affordable compared with other materials and is easy to install. When installed correctly and treated properly with the right chemicals, it can provide decades of protection for property owners. Vinyl – More and more property owners in Ohio are turning to vinyl when choosing a material for their gardens or perimeter fencing projects. Vinyl is extremely durable and can withstand prolonged exposure to harsh weather conditions. It is also very lightweight and considered more cost-efficient than wood or timber. Aluminum – This excellent fencing material is low-maintenance, rustproof, affordable (compared with wrought iron and other materials), and visually appealing. Steel (wrought iron) – For those who are aiming for grandiose appeal, wrought iron fences are their best pick. Steel fencing systems are extremely tough and durable, and they can be designed with intricate details that are not possible to achieve with any other materials. Concrete – Many of our clients still prefer to have concrete as primary material for their fencing projects. This is understandable, given that concrete is amazingly tough and can be very decorative when handled by experts like us. Stones – For those aiming for nature-inspired appeal, natural stones count as excellent fencing materials. With a wide range of colors, shapes, and sizes, a natural stone fence system can be a mesmerizing sight in any property. Creative Earthscapes is considered as one of the most reliable and skilled builders of high-quality fences in Grove City and several other Ohio cities. We ensure careful planning and follow strict construction methods to come up with durable fence systems. We only use premium materials from our partner suppliers to achieve the decorative effects that our clients need, as well as to guarantee the longevity of our installed structures. So for truly exceptional perimeter or garden fencing, dial (614) 322-3333 today!